Hyderabad,Telangana has advertised for the recruitment of Teaching Faculty- PGT,TGT jobs vacancies. 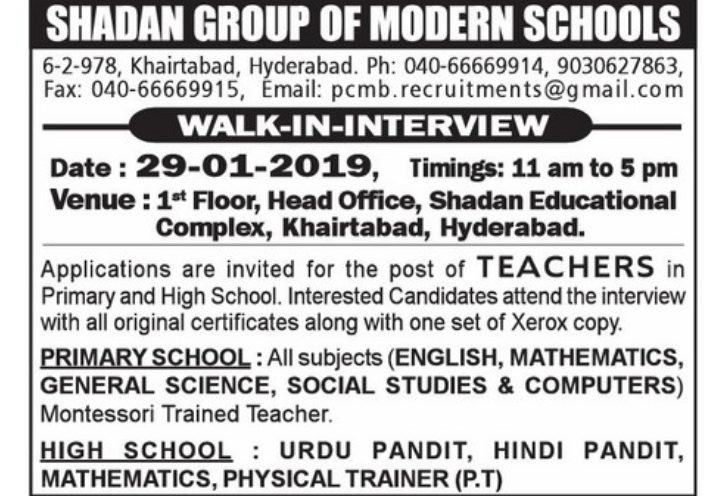 Interested and eligible job aspirants are requested to attend walk-in 29.01.2019. Check out further more details below. Name of the School: Shadan Group of Modern Schools, Hyderabad,Telangana. About School:The Shadan Educational Society was registered as an Educational body in the year 1985, under A.P. registration Act of 1350 Fasli. This Society is a Minority Body with the main objective to promote and popularize Quality and Modern Education among the general masses, and more particularly the minorities. This Society has come to the fulfilment of its desires by establishing several institutions with varied combinations of courses from Kindergarten (K.G) to Postgraduate (P.G) level for both boys and girls. The Society has first fulfilled all the conditions individually required for the establishment of such institutions by means of depositing huge amount of rupees as corpus fund in the joint account of the Government. The Management obtained the necessary permissions from the State Government and from All India Council for Technical Education (AICTE). Thus, the affiliation from School of Secondary Education, Board of Intermediate and Osmania University has been obtained for respective institutions. The affiliation for Engineering Colleges and the Pharmacy Colleges are obtained from J.N.T.U., Hyderabad. How to Apply: Applications are invited and cancidates attend the interview with all original certificates along with one set of Xerox copy.